Taylor’s checkerspot butterfly is historically known to occur in western Oregon, Washington and British Columbia. It is currently restricted to one site in BC, two in Oregon and less than ten in Washington. Occurring in grassland and grass/oak woodland sites where food plants and nectar sources are available, the Taylor’s checkerspot butterfly population has declined greatly with the loss of prairie habitat in the region and the spreading of invasive plants. In 2013, the US Fish and Wildlife Service listed Taylor’s checkerspot butterfly as endangered under the Endangered Species Act. The Cascadia Prairie-Oak Partnership (CPOP) is an ecoregional group that brings together conservation focused professionals that represent state, federal and local government, military, conservation groups and other entities interested in prairie-oak conservation. CPOP was created to increase coordination between these groups in order to promote conservation action, leverage funding, and expand recovery efforts. The Taylor’s checkerspot butterfly working group first convened in 2010 and meets annually to discuss and prioritize recovery actions. Each CPOP working group maintains an Action Plan, a document that lists the ‘next best tasks’ that can be taken to improve the status of the species and ranks the highest priority actions. Each year at the annual meeting the list is updated to reflect completed work, new opportunities and changes in urgency. 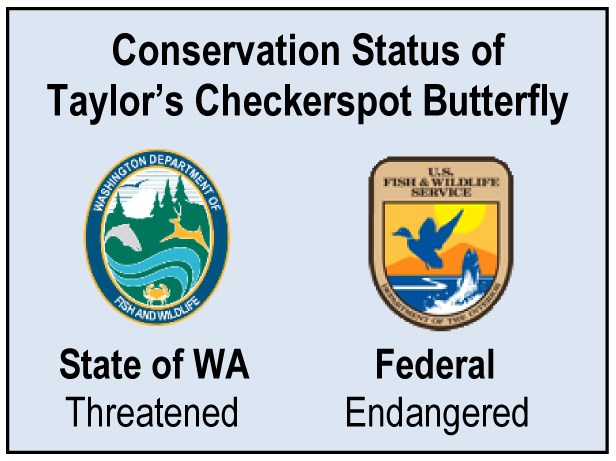 The Action Plan is meant to encourage dialogue and consensus among the group as well as to inform entities that work with conservation policies and funding, such as US Fish and Wildlife Service, as to what actions are priorities to support the recovery of Taylor’s checkerspot butterfly. Enhance habitat by controlling/removing invasive species and structural modifiers, and enhancing larval food and nectar plants as appropriate. Continue to implement captive rearing and reintroduction programs, including monitoring source and release sites in South Sound. Develop suitable survey and monitoring protocols to determine occupancy, trends, distribution, and abundance. Annually monitor all known populations. Determine and implement best approach for increasing numbers of populations within each region (e.g. habitat enhancement, habitat manipulations, translocation, captive rearing and reintroduction). Minimize direct impacts to occupied sites. Pursue conservation easements, acquisitions, and management agreements. Understand oviposition site selection and larval mortality in response to plant community characteristics and thermal context. Improve connectivity between occupied areas and/or suitable habitat . Identify and prioritize potential future release sites in coordination with recovery planning efforts and entities (esp. in OR). Evaluate quality of various host species in relation to butterfly performance in all life stages (e.g. phenology, chemical content, abundance, environmental, etc.). Where appropriate, initiate efforts to increase the number of populations through captive rearing and reintroduction (by region). Reduce and resolve conflict at sites where both Castilleja species occur and coordinate future reintroduction of either species. Research and develop best management practices for using fire in relation to butterfly recovery. Improve our understanding of the influence of weather and climate change on population dynamics and reintroductions. Review data from genetic and meta-population studies to direct population management. Refine criteria and establish standardized habitat assessments (by region) to evaluate habitat suitability. Evaluate long and short distance dispersal in the context of landscape and local factors, including understanding criteria for effective corridors. Prioritize and survey suitable habitat to identify additional populations and/or expansion. Share information between entities, establish partnerships, and maintain a working group. Captive breeding programs have provided a reliable population for reintroduction efforts. An increased amount of land has been protected through purchase or conservation easement, allowing for restoration work to begin. Coordination with the US Forest Service has reduced threats to occupied checkerspot sites and has led to increased site enhancement. Genetic studies have been funded and research has begun. Larval and nectar native plant production has increased, providing greater support for habitat enhancement projects. Monitoring methods were refined, allowing for trend detection. Oviposition research has allowed for improved understanding of breeding habitat requirements. An integrated strategy to enhance suitable habitat is being implemented on multiple protected lands in in preparation for reintroduction. 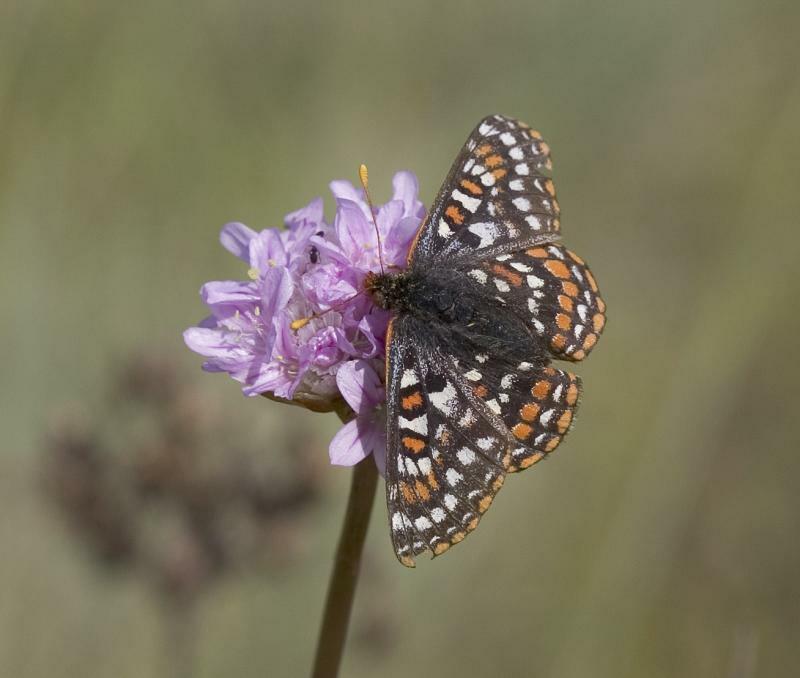 Click here to access information from the Edith's checkerspot workshop.